Hue imperial city is not only attractive to visitors by the ancient architectures and cultural features, but also it is the paradise of gastronomic enthusiasts. Coming to Hue cuisines, you can eat a variety of dishes from the sidewalk food to the unique dishes of Hue imperial palace. 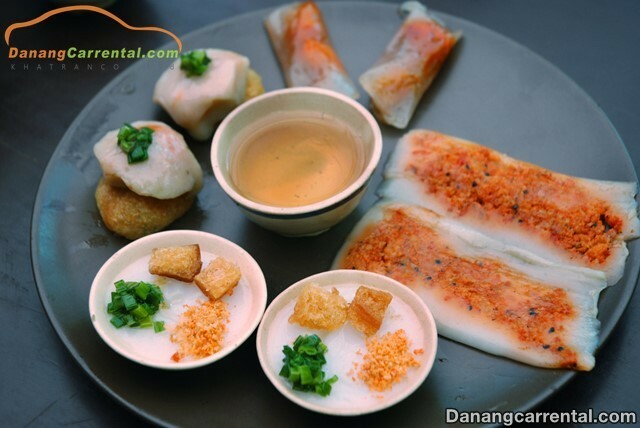 Now, we would like to introduce you some dishes you must enjoy when travelling to Hue. What should we eat in Hue tourism? “Bun bo Hue” has a unique flavor that is not available anywhere in Viet Nam. It is the sweet water of the beef’s bones, the flavor of shrimp taste and lemon grasses as well as the softness of Van Cu noodles (famous vermicelli village). Besides that, there are pieces of fresh beef, greasy pork with lemons and herbs on the bowls of “Bun bo”. These flavors are blended together that you can not forget. Especially, “Bun bo Hue” is very delicious not in the luxurious restaurants but also in the pavement ones with affordable prices. 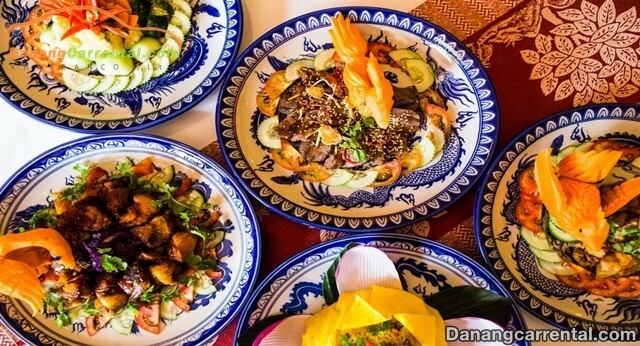 The famous restaurants in Hue such as “Bun Mun Rot” near Dieu De pagoda, “Bun Le” on Dien Bien Phu street, “Bun bo Hoi bao” on 22 Le Loi street or “Bun chi Phung” on Nguyen Du street are the usual addresses that many visitors usually eat most. “Com hen” is a popular dish in Hue city. Initially, it is just a bowl of cold rice eaten with mussels in every meal of the poor. Then, it gradually became the king’s dish and now is the specialty of the imperial city. “Com hen” looks simple but the process to make it extremely elaborate. It is from the stage to take the mussels, filtrates the mussels until prepares spices and some dishes to eat with “Com hen”. Not only that, the “Com hen” expresses the law of yin and yang as well as the combination of ingredients perfectly in the style of this place. It is the reason why people say that “Com hen” is one of the speciality foods in Hue because it looks simple but charming and meticulous. Today, “Com hen” is varied into many dishes such as “Bun hen”, “Mi hen”, “Hen xao”,… still delicious and ensure the taste as “Com hen”. 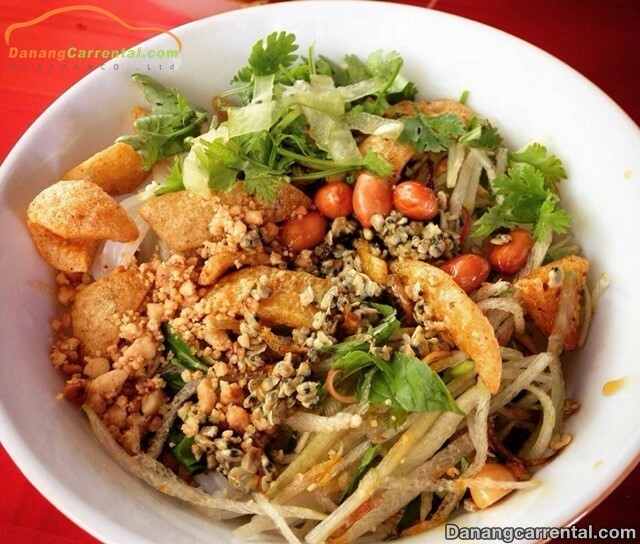 The price of a bowl is very cheap, just about 7,000 VND– 10,000 VND depending on each restaurant. You can eat this dish at the Hoa Dong restaurant (“Con hen”) or “Chi Nho” restaurant on Pham Hong Thai street, “Bun hen” on 17 Han Mac Tu street. “Banh canh Nam Pho” is usually sold by the peddlers in the city. The consistency of the flour and the fresh shrimps are pounded into pieces. It is eaten with fish sauce and hot green pepper. 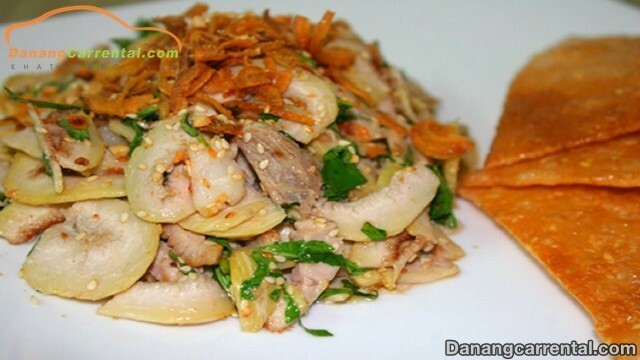 That is the favorite dish of people in Hue city for a long time. 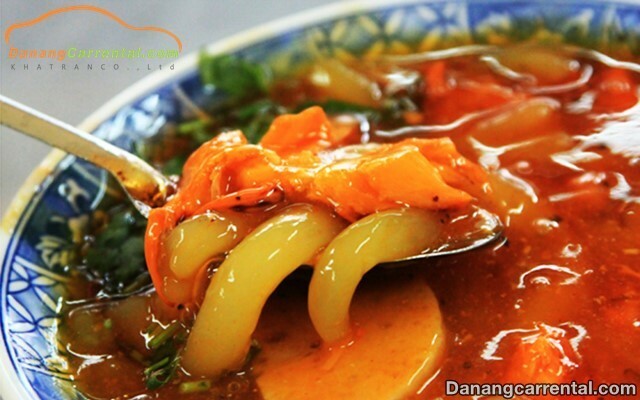 Each bowl of “Banh canh Nam Pho” in Hue cityjust sets you backfrom 10,000 VND – 15,000 VND. It is available on Pham Hong Thai street (the most famous restaurant is Thuy on 16 Pham Hong Thai, opens from 3:00 – 9:00 pm). Hue is the birthplace of Buddhism in Viet Nam, so vegetarian cuisine is very delicious here. Vegetarian rice is very vary from cakes to “nom”, “bun”, “my” and hot pot,… in order to enjoy vegetarian rice, you can go to Tu Dam pagoda on Dien Bien Phu street or vegetarian rice Lien Hoa on Le Quy Don street (tourists often come here by the beauty of this space and delicious food quality), or more popular is Thanh Lieu restaurant on Nguyen Cong Tru street. “Va tron” is made from figs (a kind of figs) to reduce the intensity and softer, mixed with lean meat, boiled shrimp, sliced pig meat with herbs, spices, sprinkle a little more sesames, when eating, you just need to take the baking paper to grate. 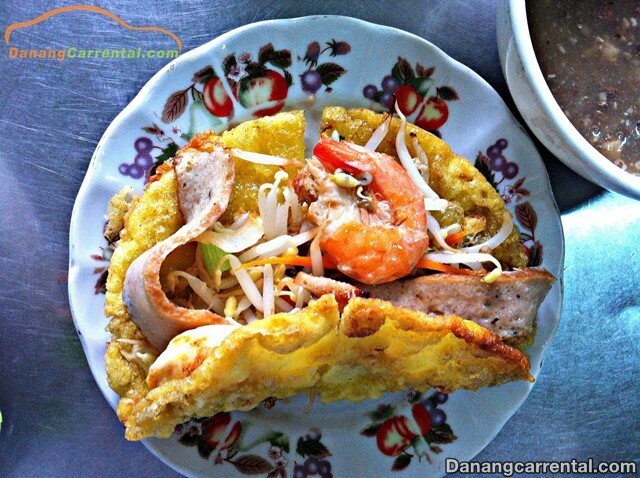 With greasy and aromatic flavors of fruit mix with other ingredients, then blend with the crisp of “Banh trang” make the taste extremely attractive that you can not stop eating. It is not difficult to find a “Va tron” restaurant at many small restaurants in Hue city. Hue is famous for cakes which are one of the speciality foods here. Referring to Hue cakes, people will immediately think of “Beo, Nam, Loc”. 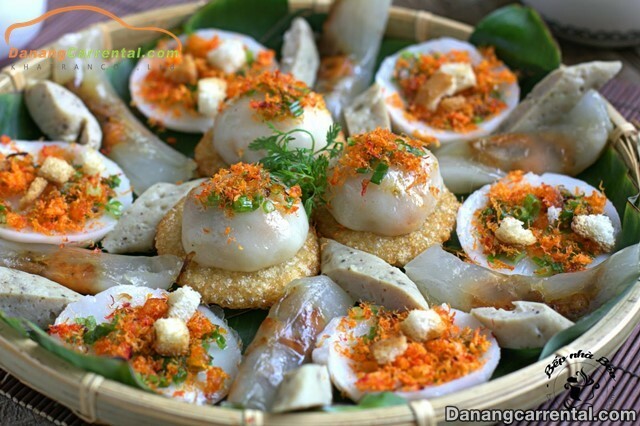 “Banh beo” is made from flour of rice and its shape like water-fern leaf. When you eat, you will feel the greasy, sweet and fresh taste of “Beo” cakes and the shrimp sprinkled on top, the salty sweet sauce with the crisp of fried fat meat. It is very delicious without descriptions. “Nam” cake is also made from rice flour ,but is wrapped with phrynium placentarium leaves which has shrimp and meat inside. It has fragrant flavor and make you unforgettable. “Loc” cake is made from cassava roots, with shrimp and fried fat meat is inside, too. It can be wrapped with banana leaves or not, then hard-boiled to eat with fish sauce. Some famous restaurants that you can eat this kind of cake is Ba Cu on Nguyen Hue street or Ba Do on Nguyen Binh Khiem street. Besides that, you should not mix to try “Khoai” cake. “Khoai” cake does not mean that you feel really attracted to this dish, it is just because when pouring the powder into the pan, You can see lots of smokes from the pan rise in curls, soHue people call “Khoai” (in the dialect: smoke = “khoai”). “Khoai” cake with crispy crust is made from flour of rice mixed with lean meat, fried mushrooms served with figs, green bananas and raw vegetables. Then, you dip “Khoai” cake into the sauce called “Nuoc leo” – made from peanuts. It will be very delicious. There are some famous “Khoai” cake restaurants in Hue such as Thuong Tu “Khoai” cake and Hong Mai “Khoai” cake on Dinh Tien Hoang street. 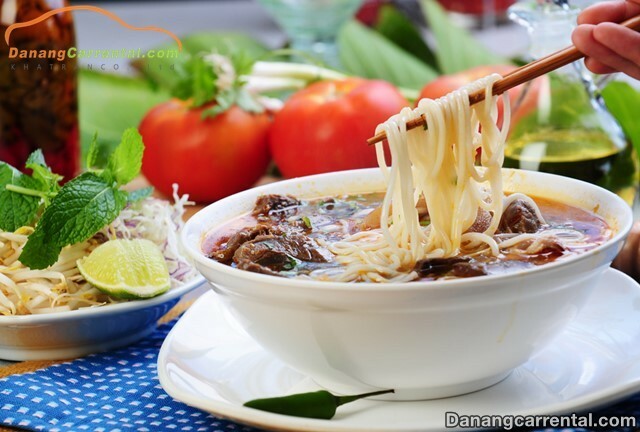 These are the dishes that can answer easily your inquiry of which food you should eat when travelling to Hue. Hue cuisine is full of delicious dishes that the price is very cheap, just 100,000 VND, you can eat lots of dishes. There are also many other dishes, we will add in the next time. For more information or rent cheap car to visit famous sites in Hue, do not forget to contact Kha Tran Car rental hotline Ms Anna: (+84) 916510201 or Ms Katharine: (+84) 34 797 6789. Wish you have a fun and exciting trip in Hue city!